Just imagine it. You step up to the corner of the skyscraper. You look down through the plastic lenses of your mask — and down is a long way down. But who cares? It’s a beautiful spring day, the sun is out, and you’re in New York City. So you step off into space, gravity catches you, and you’re cannonballing toward the ground. Lazily, you stretch your right arm out, aim, and double-tap your web shooters. The webline streams out and adheres to a wall. The line goes taut, but you’re holding on as you swing in a tight parabola. Then you let go, pull a pretty slick backflip, and momentum carries you past a window and a group of shocked office workers. Maybe you give them a jaunty wave as you pass. That’s what you do. There’s a reason why Spider-Man matters still. Stan Lee and Steve Ditko created the character in 1962, and he appeared in the pages of Amazing Fantasy #15. Would you believe me if I told you that Stan Lee’s boss hated the idea, the very concept of the character? I’ll let Stan explain. That’s just it. A superhero can be anyone. You don’t have to be a rich white dude like Batman, a patriotic white dude like Captain America, or a scientific genius white/green dude like The Hulk. Under that mask? Anybody. You. The tragedy is that none of the wall-crawler’s cinematic appearances have dealt with that idea. Well, it would be a tragedy, but luckily the new film Spider-Man: Into the Spider-Verse examines that, and a lot more. Right out of the gate, things are a little different. There’s still a Peter Parker (Chris Pine) who swings around in his longjohns. Only this Peter is mega-popular and mega-successful. So when he’s battling the Green Goblin in a cavernous underground lair, why wouldn’t he think it’s just another day at the office? Only it isn’t since the Kingpin (Liev Schreiber) has been bankrolling the creation of a machine, one that can open portals to alternate dimensions. Why? His wife and son have died, but he can always grab another family. The plan is for Peter to shut down the Kingpin’s machine and save the day. Only he doesn’t, and the Kingpin kills him. Dead. 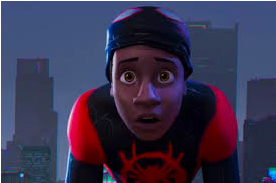 That isn’t that, because we’re introduced to Miles Morales (Shameik Moore). He’s a bright high schooler who’s a little unsure of his place in the world. Jefferson Davis (Brian Tyree Henry) is his dad and as a cop, he wants to push his son just a little bit harder. Rio Morales (Luna Lauren Velez) is his mom, and she loves him regardless. Miles idolizes his uncle Aaron (Mahershala Ali), who’s estranged from the family and just might be up to something a little sketchy. Oh, yeah, and then Miles is bitten by a radioactive spider. And he witnesses the death of Spider-Man. And he’s having some issues with the fact that he can stick to stuff, leap around like an Olympic gymnast, and occasionally turn invisible and emit electrical energy. And he’s being relentlessly pursued by The Prowler, a bruiser in the employ of the Kingpin. Peter B. Parker (Jake Johnson), a middle-aged crimefighter who’s divorced, depressed and sporting the beginnings of a gut. Gwen Stacy (Hailee Steinfeld), a Spider-Woman who carries around both power and guilt. Peni Parker (Kimiko Glenn), a middle-schooler who’s psychically linked to a mech suit. Spider-Man Noir (Nicolas Cage), a hard-boiled hero from the 1930s. Along with Miles, they must work together to stop the Kingpin, shut down the extradimensional doodad, and get home to their respective planes of existence. Hating superhero movies has become fashionable. It’s even more fashionable than tweeting about ironically drinking Pabst Blue Ribbon. ** I get it. After the Marvel Cinematic Universe got up and running in 2008, a template was established that was rarely deviated from. Those films have made billions and entertained billions. If the MCU isn’t your jam, it can sometimes feel a little…oh….omnipresent, no? Bear in mind that the superhero genre isn’t the problem, and when a movie pushes a genre into daring new territory, magic happens. 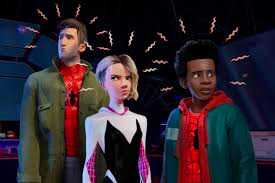 With Spider-Man: Into the Spider-Verse, directors Bob Persichetti, Peter Ramsey, and Rodney Rothman have made an animated film that’s unlike anything I’ve ever seen. They have created a hybrid style that feels like a living comic book panel, using rendered CGI frames layered over with old-school 2-D animation. The feeling is otherworldly, where bright colors jostle the frame with comic-booky sound effects. You could take any image from this film, frame it, and you’d have some pretty respectable pop art. The better news is that the script by Rodney Rothman and Phil Lord of The Lego Movie is just as clever and speedy as the look of the film. There’s an absolute blizzard of jokes referencing the 56-year legacy of Spider-Man, everything from the annoyingly catchy cartoon theme song to iconic film moments to deep-cut trivia likely only noticed by nerds such as myself. At times, the script slows down to get serious. When it does, the emotion is genuine and real. *** The character work is outstanding, and everything from broad gags to quiet reflection is all in service toward telling us who these folks are. While I felt like we had a fairly underwritten villain in the Kingpin, it almost didn’t matter to me with all the other people jumping and thwipping around. The cast in this thing? Holy God. We don’t have a bunch of lazy celebrities slumming doing voice work. Everybody is taking a cartoon about a superhero deadly serious, particularly the jokes. As Miles, Shameik Moore does the majority of the heavy lifting, and he’s able to bring the humor and pathos. I loved his relationship with Brian Tyree Henry’s Jefferson, as well as his hero worship of Mahershala Ali’s Aaron. Midlife crisis Spidey as portrayed by Jake Johnson is entertaining, and he’s able to sling self-pity as fast as a quip. Listen closely for Lily Tomlin as Aunt May and the mighty John Mulaney as Spider-Ham. 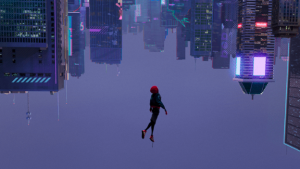 Spider-Man: Into the Spider-Verse is amazing. Spectacular. Perhaps even the ultimate iteration of the beloved character. This is easily the best animated film of the year, and one of the best films of the year period. It captures both the spirit of Spider-Man and the spirit of the medium he was born in. More importantly? It tells us that whoever you are or whatever you look like, you can be a hero. **Now that I think about it, maybe it’s become fashionable to complain about ironically drinking Pabst Blue Ribbon. ***As opposed to Thor: Ragnarok. I really dug that film, but it has a nasty habit of undercutting the emotion with gags.